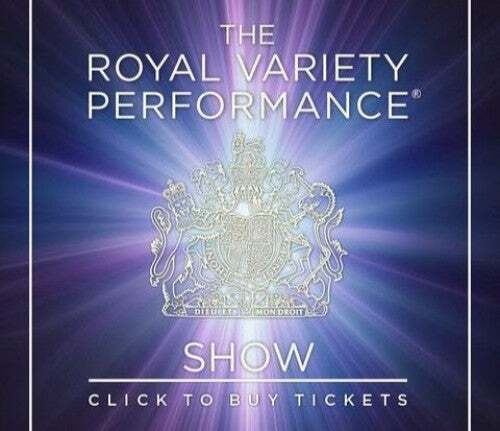 After three years at Drury Lane,the Royal Variety Performance returned to the Victoria Palace for only the third time in its history. 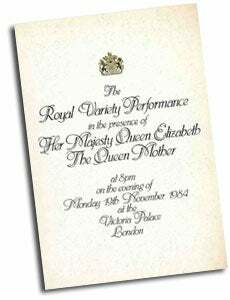 The show was attended by the Queen Mother, Prince Charles and for the first (and only) time, Princess Diana, who were all treated to a theme of 'Comedy Tonight' - an appropriate theme in a theatre where the Crazy Gang had starred for many years. Indeed, the warm-up from Barry Humphries, Eric Sykes and Spike Milligan, was in Crazy Gang style, and later, Bernie Winters and Leslie Crowther starred as Flanagan and Allen. 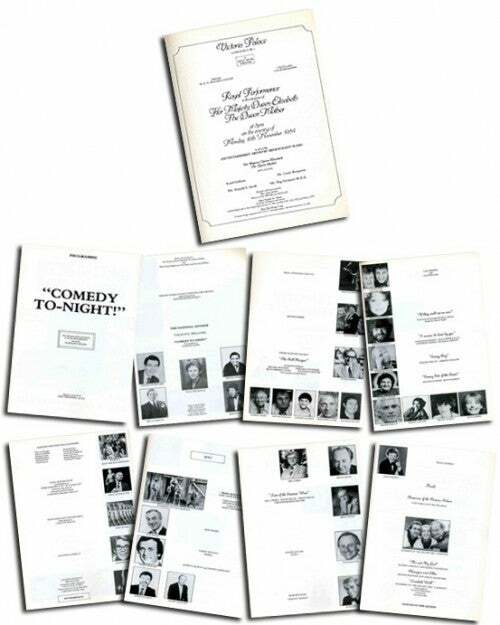 Roy Hudd, Paul Daniels and Ronnie Corbett, all well-used to Royal Variety Shows, showed their mastery of comedy on the stage, while two young comedy stars Robert Lindsay and Emma Thompson performed with members of the Me and My Girl cast. The evening had the best possible end when Max Bygraves serenaded the Queen Mother. It probably came as a consolation to young performers to fine that even a comic as seasoned as Roy Hudd, can get just a tiny bit jittery about appearing in a Royal Variety Performance. In 1984 he went on to deliver a marvelous monologue by Keith Waterhouse and Willis Hall about a policeman walking home off-duty when he passes Buckingham Palace and sees a girl running across the courtyard minus one item of footware 'to wit - a glass slipper'. It was a wonderful piece and went down extremely well, particularly with the Prince of Wales who said to Roy Hudd after the show, "Don't laugh, I know policeman like that!" - all of which made the twenty circuits Roy made of the Victoria Palace, as he went through his lines, more than worth the anxiety. Backstage, Spike Milligan, was in great form in his dressing room, telling stories and joking with friends, The only distraction to the constant flow of Milligan-isms was the tannoy carrying the show up from the stage, but Spike soon dealt with that, ripping it from the wall and then saying. "Right - maybe I can get to the tag of this one now." At the presentation after the show, he asked the Prince of Wales whether he had enjoyed the show, adding, "I've had a word with the missus. She said she enjoyed it." The heir to the throne said that he had enjoyed the show very much as well. When the time came for the Royal party to leave, Prince Charles, said to Spike, "Goodbye Milligoon." "Goodbye trainee King" called Spike as the prince walked away. "You're for the tower, Milligan," he said, turning with a huge grin, before leaving to join the princess. Constructing an all-comedy show is not as easy as it may seem, or as the ratings suggest (this one went straight to number one). 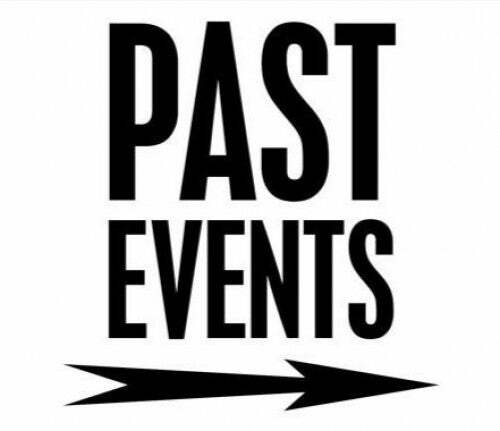 There's no telling how things will go, and for the presenter and director the worst aspect is running time, which can go seriously awry without a firm hand - even if it feels like a wing and prayer at times. 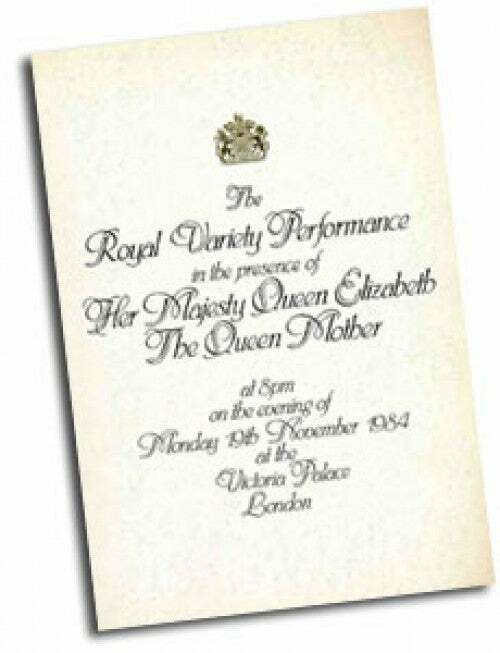 As with all Royal Variety Performances there was great goodwill and support in this one. Writing in the programme, Louis Benjamin remarked, "For instance, in what business, other than show-business, would you phone all the way to Australia to ask such a celebrated personage as Dame Edna Everage to do a mere ninety-second spot and get an instant "Delighted Possum" from Barry Humphries? 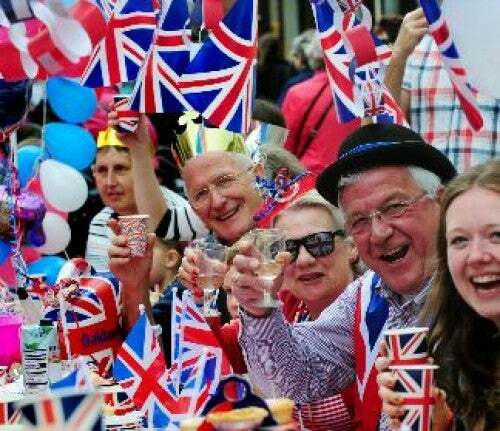 Or get so many big names who usually take the stage for fifty minutes or more, settle for just one minute or two and in the case of one particular star - who will be witnessed if you watch the Royal arrival closely - agree to appear without actually doing anything or saying anything!" The wonder of technology made it possible to view Torville and Dean's latest dance routine. The ice dance number was recorded in Australia and transmitted to the show via satellite. The skaters flew over especially (although not by satellite) to be introduced to the Royal Party. Anthony Gatto was one of the youngest artistes to be asked to appear at the Royal Variety Performance. A precocious juggler. Anthony twirled hoops and batons almost as big as himself. The audience must have wondered if they were seeing things as they scanned the Royal Box. Dame Edna Everage, housewife superstar, was holding court there and had to be persuaded to vacate the premises!